Saint is a term of hallowness that designates individuals who are renowned for their spiritually exemplary character. Although the Roman Catholic Church established a most advanced and formalized process of canonizing saints in the twelfth century, all religions have actually produced their own ways, if less formal, of naming saints who are overwhelmingly dedicated to the love of the divine. Saints are known for their devotion to God as well as for their commitment to virtuous living. In each new age in the religious history of mankind, saints have encouraged ordinary believers to strive to become closer to God and to be better people, by providing an uplifting example of spiritual and moral conduct. The similarity of saints among the world's religions demonstrates that religious communities could benefit from greater inter-religious dialogue to share the spiritual riches found in the different faiths. The term saint is derived from the Latin word sanctus, meaning "holy" or "consecrated." This is, in turn, a direct translation of the Greek word "άγιος" (hagios), which also means "holy." In its original scriptural usage it simply means "holy" or "sanctified." In this form, it can be applied to a "holy" person, a place (άγιον όρος, "The Holy Mountain," Athos), a thing—such as Scripture itself (αγιογράφικα, "Holy Writing")—or even God (άγιον πνεύμα, "The Holy Spirit"). 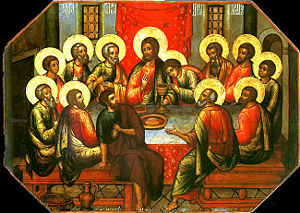 However, the early Christians began to use the term "Saint" more narrowly to refer to specific, exemplary individuals. The earliest known occurrence of άγιος as "saint" (in the modern sense) seems to be in the Shepherd of Hermas, a gnostic text authored sometime in the second century. In the early Christian church, the first saints were those who paid the ultimate sacrifice for their belief: the martyrs (literally "witnesses for God"). These figures and the early "confessors" who followed and were recognized for their virtuous lives were the first Christian saints. They were understood as "friends and servants of God whose holy lives have made them worthy of His special love." This perceived closeness, which was notably lacking in the "nasty, brutish and short" lives of the average peasant believer, motivated feelings of devotion and adoration, which often culminated in the development of local cults. Another major impetus behind this cultic observance was the perceived "thaumaturgical" power of the figures: the understanding that they had the ability to intercede in the natural order, to act on behalf of their patrons with regards to the Divine. It is notable that the most relevant feature of these early saints, at least in terms of the development of a popular cult, was their continued posthumous efficacy. When a given cult became particularly prominent, it often came to be endorsed by local bishops, who encouraged this devotion for both spiritual and worldly ends. André Vauchez, a well-respected authority on Christian sainthood, goes so far as to suggest that "the majority of well-documented devotions were located at the level of local sainthood, that is where the religious conceptions of the faithful and the requirements of the clergy intersected." This ecclesiastical legitimation of popular figures represented the first step towards the development of formal canonization. Even at this early stage of the Christian understanding of sainthood, certain saints began to be identified with particular communities, occupations, or even abilities (for example, the ability to find lost items as in Saint Anthony the Great or to travel safely as in Saint Christopher). These patron saints, whose areas of influence often emerged from popular practice and superstition, came to be acknowledged and even authorized by bishops. Further, these types of associations (whether to particular aptitudes, localities, or occupations) were sufficiently important that they continue to be heeded in Catholic and Orthodox Christianity up to the present day. The understanding of sainthood in the Roman Catholic Church developed directly from this early Christian context. The primary difference was that, as time went on, the papacy began to take a more and more active role in the determination of whether an individual was fit for popular veneration. This culminated in a bull from Pope Alexander III (r. 1151–1181), which forbid bishops from approving cults without official Vatican sanction. From this point, the papacy developed a laborious juridical process for assessing the sanctity of these figures—one that, much like a modern court case, involved the appointment of "prosecutors" and "defendants," the questioning of witnesses, and the analysis of documentary evidence. If all of these elements were seen to be favorable, and if a minimum of two posthumous miracles could be credited to the figure in question, they were eventually canonized—publicly affirming them as suitable targets for veneration and as figures with continued power to intercede on behalf of the faithful. (For more information, see Canonization). In Roman Catholic practice, saints can be asked to intercede or pray for those still on earth. The memory of these holy individuals is incorporated into the Catholic liturgy through the liturgical calendar and religious artwork. Each saint recognized by the canonization process is assigned a feast day and masses on that day will ostensibly be directed towards these figures. However, it should be noted that many of these feast days are only seen as possessing secondary (or even tertiary) importance, to the extent that many are only observed in particular localities or by particular religious orders. The majority of Catholic churches are adorned with numerous depictions of saints (in addition to the more numerous images of Mary and Jesus). These images are understood to impart the religious significance of the gospel (and of the exemplary lives of the saints) in an awe-inspiring, non-discursive manner—suitable to the needs of all the faithful (not merely the literate), and veneration towards them will be encouraged. Thus, the painters of Siena, a fourteenth-century guild of Catholic artists, justify their religious merits as follows: "The paintings of the churches are in place of books to the uneducated (quasi libri laicorum)…. We are, by the grace of God, those who manifest to the faithful the miracles wrought by faith." In the Eastern Orthodox Church, a "saint" is defined as anyone who has ascended to Heaven, whether recognized by earthly religious communities or not. By this definition, Adam and Eve, Moses, the various prophets, and the angels and archangels are all given the title "saint." Because the church acknowledges no distinction between the living and the dead (as the saints are considered to be alive in Heaven), saints are referred to as if they are still alive. Saints are venerated but not worshiped. They are believed to be able to intercede for an individual's salvation and to help mankind through either direct communion with God or personal intervention. Orthodox belief posits that sainthood is revealed through God's grace, as evidenced by answered prayers and other miraculous evidence of the saint's intercessory power. After the divine revelation of an individual's sainthood, it is considered appropriate for a community to begin venerating the individual. For this observance to expand beyond the local level, the saint must be formally recognized by a synod of bishops, who assemble to deliberate on the merits of the case. If successful, this process is followed by a service of Glorification, in which the saint is given a day on the church calendar to be celebrated by the entire church. A great part of the Orthodox belief centers on the veneration of saints, as they represent both moral exemplars and "windows" to the Divine. Despite this, the Eastern Church has, in the past, contended with controversy surrounding this practice, particularly as evidenced during the Byzantine Iconoclasm of the eighth and ninth centuries. During this period, the theological justification for venerating saints was deeply questioned. Assertion that the biblical commandment forbidding images of God had been superseded by the incarnation of Jesus, who, being the second person of the Trinity, is God incarnate in visible matter. Therefore, they were not depicting the invisible God, but God as he appeared in the flesh. This became an attempt to shift the issue of the incarnation in their favor, whereas the iconoclasts had used the issue of the incarnation against them. Emphasis on the distinction between "idols" (which depict persons without substance or reality) and icons (which depict real persons). Essentially the argument was "all religious images not of our faith are idols; all images of our faith are icons to be venerated." This was considered comparable to the Hebrew Bible practice of only offering burnt sacrifices to God, and not to any other gods. Analysis of the written tradition opposed to the making and veneration of images, and claim that icons were part of unrecorded oral tradition (parádosis, sanctioned in Orthodoxy as authoritative in doctrine by reference to 2 Thessalonians 2:15, Basil the Great, and so on). Argument that the decisions about whether icons ought to be venerated were properly made by the church assembled in council, not imposed on the church by an emperor. Thus, the argument also involved the issue of the proper relationship between church and state. Related to this was the observation that it was foolish to deny to God the same honor that was freely given to the human emperor. (For more information, see Iconoclasm). The importance of the cult of saints is also seen in the Orthodox understanding of the sacrament of baptism. When a person is baptized in the Orthodox Church, he or she is resacralized and given a new name, which is invariably the name of a saint. The newly re-christened adherent begins to use this new name as his/her own during communion, and the saint is understood to become their personal patron. In many Protestant churches, the word "saint" is generally used to refer to anyone who is a Christian, in a similar manner to Paul of Tarsus' use of the term in the New Testament. In this sense, anyone who is within the Body of Christ (a born-again believer) is Holy because of their relationship with Jesus. Although high-church Anglicans and Episcopalians use the term "saint" in a similar manner to the Catholics, a number of Protestant churches decry the Catholic practice, as they believe that the dead will not rise until the Last Judgment. As a result, they deny the Catholic/Orthodox belief that saints are in Heaven, and some go so far as to consider prayers to the saints as idolatry or necromancy. The provinces of the Anglican Communion commemorate many of the same saints as those in the Roman Catholic calendar of saints, often on the same days. There are several people commemorated in the modern Anglican calendars who were opposed to the reformation of the English Church. Of particular note are John Fisher and Thomas More, executed by Henry VIII for not assenting to his Act of Succession. These two were later canonized by Pope Pius XI, and their presence in Anglican calendars demonstrates the inclusive breadth of Anglicanism, its sympathy for the victims, both Catholic and Protestant, of its formation, and its view of itself as "both Catholic and Reformed." Anglican churches also commemorate various famous (often post-Reformation) Christians. The west front of Westminster Abbey, for example, contains ten niches with statues of the twentieth-century martyrs Maximilian Kolbe, Manche Masemola, Janani Luwum, Grand Duchess Elizabeth Fyodorovna, Martin Luther King, Jr., Oscar Romero, Dietrich Bonhoeffer, Esther John, Lucian Tapiedi, and Wang Zhiming. English and local saints are often emphasized, and there are differences between the provinces' calendars. Some Anglicans consider Charles I to be a martyr and saint. The Church of Jesus Christ of Latter-day Saints hold similar beliefs to the Protestant tradition with regards to the concept of sainthood. Given the New Testament usage of the term saints to refer to all those who have entered into the Christian covenant by immersion baptism. Likewise, members of their tradition follow this usage, referring to themselves as "Latter-day Saints" (or simply "Saints") among themselves. It is common journalistic (or even scholarly) shorthand to refer to any ethically ideal (or idealized) human being as a "saint," regardless of their tradition of origin. This is, in actuality, a questionable practice. As suggested by Clifford Geertz, we must acknowledge the context of figures, beliefs, and practices before we can generalize about them or consider them in light of other cultural systems—and even then, those generalizations must be acknowledged as being both contingent and tenuous. In this light, we must note the undeniable early Christian context of the term "saint" and its related understanding of sanctity (including, but not limited to, such elements as sexual chastity, posthumous efficacy, and unshakable devotion to God, even under pain of death). As such, the purpose of this proviso is to highlight the fact that the figures identified and discussed below are only partially congruent with the Christian notion of sainthood introduced above. This means that, while these brief comparative mentions are sufficient to note the presence of some similarities, a deeper understanding of these holy figures will require a more in-depth analysis of the respective traditions from whence they emerged. Traditionally, Islam has had a central place for awaliya (Arabic: literally "friends of Allah;" singular: Wali) within its cosmology; a tradition so venerable that these figures are specifically mentioned in verses of the Qur'an. Although there is no formal canonization process in Islam, a typological schema for ascertaining sanctity has been derived from the hadith traditions of Muhammad and the sayings of the scholars of Islam. These revered qualities include soundness of faith (aqidah), an upright moral character, a strict adherence to the prophetic traditions (sunnah) and to Sharia, the performance of charismatic marvels (karamat) and, most crucially, consensus of the faith community that the person is a saint. To put this final point more bluntly, if the Muslim masses consider someone a saint, he or she is one. The veneration of the awaliya ("master" or "friend of Allah"), especially at their tombs or shrines, is a very widespread practice in Islam, and is common throughout the Muslim world, including the conservative Arabian Peninsula. Saints are believed to have the power of intercession with Allah, which yields the ability to perform miracles and to give power or blessings (known as barakah). In most Muslim countries, there are religious festivities associated with these holy figures, such as the Urs festivals in India and Pakistan, and the annual Mawlid in Egypt. For example, a great Urs is held annually in the valley of Mohra Sharif, where great awaliya are still believed to live. During this festival, the local saints are venerated, with the expectation of future blessings. Believers are nevertheless careful to distinguish between the blessings of the prophets (particularly Moses, Jesus, and Muhammad) and those of the saints. There is also a spiritual hierarchy of awaliya in Islam, with the Kutb or Ghawth at the apex. This hierarchy is described in detail in the work of the great Andalusian Sufi Muhyuddin Ibn Arabi, who is considered one of the great saints of Islam. Finally, the awaliya are an important component of popular Islam and are associated with Sufism, which includes many of the mystical branches of Islam. Sufism has several orders with precepts (tarika) for students (murid) who seek to follow the teachings of these holy exemplars. Although these figures are acknowledged by many Sufis, Sufism distances itself from the more animistic and cultic aspects of the veneration of saints, which include, as in popular Christianity, all types of religious paraphernalia and popular rituals. The Jewish notion that most clearly resembles the Christian "saint" is the tzadik, or a "righteous one." The Talmud says that at any time at least 36 tzaddikim are living among us; they are anonymous, but it is for their sake that the world is not destroyed. The Talmud and Kabbalah offer various ideas about the nature and role of these 36 tzaddikim. The term can also be used generically to mean any righteous or saintly person. Veneration of saints plays a central role in Moroccan Jewish life and is an important component of their ethnic identity (Ben-Am 1984, 207-213; Bilu 1984, 44; Goldberg 1983, 67). The tzaddik is a pious man, well versed in the Torah and kabbalistic studies, charismatic and spiritually compelling (Bilu 1984, 44; 1987, 285), deeply religious, honest, and innocent. As a saint, he possesses supernatural powers which enable him to influence events and people and to intercede with God on their behalf (Weingrod 1990, 13). These powers do not fade when the saint dies and can continue to benefit his adherents (Bilu 1987, 285). Among Moroccan Jews, faith in saints is strongly entwined with the Jewish mystical tradition and with the Maraboutistic element that characterizes North African Islam (Goldberg 1983, 67-68). However, unlike Islam, Jewish custom centered around the graves of deceased saints (Bilu 1987, 285; Ben-Ami 1984, 190), although there also were living saints in Morocco (Ben-Ami 1984, 46-55). What differentiated these tzaddikim from ordinary mortals was their ability to perform miracles; to cure the sick, eliminate danger, protect, and rescue (Weingrod 1990, 13-14). A person who had received a miracle often became the saint's "slave:" That is, a special relationship developed between the saint and the "slave" who submitted completely to the saint and accepted his every pronouncement (Ben-Ami 1984, 54-55). "Saints" are recognized in Hinduism, although, like the Muslim tradition, they do not require canonization or similar formal process to be acknowledged as such. Generally, these holy or saintly individuals are referred to as mahatma, paramahamsa, or swami, or given the prefix Sri before their name. It should be noted that these various terms all possess different valences of meaning than the Christian understanding of sainthood. Swami, for example, is an honorific title that is loosely akin to "master" or "lord." It is derived from the Sanskrit language and means "owner of oneself," denoting complete mastery over instinctive and lower urges. It is a title added to one's name to emphasize learning and, of course, mastery of a specific field of knowledge, most often religious and/or spiritual. Another common epithet for holy people is sant, a term derived from the Sanskrit sat (truth, reality) whose root meaning is "one who knows the truth" or "one who has experienced Ultimate Reality." The term sant has taken on the more general ethical meaning of "good person," but is most often assigned specifically to the poet-sants of medieval India. Chaitanya Mahaprabhu (1486–1534), famous Bengali saint known for his ecstatic devotion to Krishna; original founder of the modern Hare Krishna movement. Jagadguru Kripalu Ji Maharaj (1922- ), the founder of the Jagadguru Kripalu Parishat, an organization which propagates Raganuga Bhakti, a form of selfless devotional practice and loving service to Radha Rani and Lord Krishna. Paramahansa Yogananda (January 5, 1893–March 7, 1952), a modern day saint who brought the spiritual science of Kriya Yoga to the west, successfully disseminating eastern wisdom all over North America and Europe and personally initiating many thousands of spiritual aspirants. Raghavendra Swami (1595-1671), one of the most famous Hindu saints was believed to have performed miracles during his lifetime and continues to bless his devotees. He espoused Vaishnava monotheism (worship of Vishnu as Supreme God) and Dvaita philosophy. Chandrashekarendra Saraswati (Sage of Kanchi) (1894–1994) Jagadguru Sankaracharya of Kanchi Kamakoti Peetham. Revered by many as an avatara of Adi Sankara. Akkalkot Niwasi Shree Swami Samarth (around 1275 C.E. ), considered to be the Guru of Great Saints and supposed to be the direct manifestation of the supreme power—God. Shirdi Sai Baba (c. 1838–October 15, 1918) was an Indian fakir/guru who is regarded by his Hindu and Muslim followers as a saint. The Dhamma (path of purification) outlined by the Buddha is said to lead the disciple eventually to the status of an ariya, a noble-hearted person, of which there are four levels of increasing sanctity and holiness. These are: Sotāpanna ("stream-winner"); sakadāgāmī ("once-returner"); anāgāmī ("non-returner"); and arhat ("worthy One")—a human being who is free from all defilements. Arhats are those who attain Nirvana. The term Buddha is used for someone who rediscovers the four noble truths and teaches others about it. Arhat is frequently used as an epithet of Gautama Buddha and his students in the liturgy of Theravāda Buddhism. Although parallels are often drawn between the arhat and the Christian "saint," one must note that the Buddhist figure is primarily characterized by inward spiritual achievement—a far cry from the emphasis on efficacious presence found in popular Christian veneration. With the development of Mahāyāna Buddhism, the arhat ideal was largely replaced with that of the bodhisattva, a being of impeccable spiritual achievement who has vowed to postpone nirvana (and remain in this world) until all beings attain enlightenment. Given this emphasis on compassion and worldly involvement, many features of the cults of bodhisattvas are similar to the popular cults of Christian saints. Indeed, although the bulk of Indian bodhisattvas represent ideals (i.e., Avalokitesvara symbolizes compassion and Manjusri symbolizes wisdom), East Asian Buddhist sects often developed involved biographies of these figures, identifying them with historical individuals of particular spiritual potency. These individuals were then thought, in keeping with the vow described above, to intercede on behalf on individuals, such that adherents "will be swiftly and miraculously rescued from danger by [them]." The veneration of Catholic saints provides one of the foci for the Cuban Santería and Haitian Vodoun religion. In both, saints are syncretized with earlier deities, and are equally worshiped in churches (where they appear as saints) and in Santería religious festivities, where they appear as deities (Orishas in Santeria and Lwa in Vodoun). Although there are many similarities between Santeria and Vodoun, they do differ in respect to their origins and source languages (Santeria is based on Spanish, while Vodoun uses a creolized French). Indeed, this adoption of Catholic Saints was fairly common in the fusion religions generated by slaves transplanted in the New World. Further, parallels can certainly be drawn between this process and the absorption of pre-Christian elements into European "Catholicism"—although with Santeria and Vodoun, the native religion seems to be more dominant. In all of the religions and cultures of the world, saints are viewed with high esteem as both moral exemplars and "windows" to the divine. Saints are seen as deeply religious, honest, and loving people who are possessed of divinity and compassion, and cannot but live for the sake of others even beyond their families and nations. They manifest divine presence, provide an example of moral rectitude, love in a way that opens the hearts of others to God, and show that righteous living is attainable even for ordinary people. If one looks at human history in terms of religion (from Latin: Religio, meaning "reconnect") as the history of reconnecting God and humanity, saints can be considered to have played a significant role as torchbearers in each new age in that history of reconnection. Perhaps, saints are not merely to be venerated as role models and serve as foci for veneration; they also call all people to emulate their behavior. Every person today is encouraged to be responsible for their own moral and spiritual actions, and in this way participate in the process of cosmic restoration. Also, when the similarity of saints among the world's religions is recognized, it shows that religious communities could benefit from greater inter-religious dialogue to share the spiritual riches found in the different faiths. ↑ Henry George Liddell and Robert Scott, A Greek-English Lexicon (Oxford: Clarendon Press, 1940). Retrieved August 13, 2007. ↑ Catholic Encyclopedia, "Saints: Canonization and Beatification." Retrieved August 13, 2007. ↑ Stephen Sharot, A Comparative Sociology of World Religions (New York: New York University Press, 2001). ↑ David Weinstein and Rudolph M. Bell, Saints and Society (Chicago: University of Chicago Press, 1982). ↑ André Vauchez, Sainthood in the Later Middle Ages, tr. Jean Birrell (Cambridge: Cambridge University Press, 1997), 157. ↑ Catholic Encyclopedia, "Patron Saints." Retrieved August 13, 2007. ↑ Catholic Encyclopedia, "Ecclesiastical Feasts." Retrieved August 13, 2007. ↑ Catholic Encyclopedia, "Religious Painting." Retrieved August 13, 2007. ↑ Bishop Iranios Pop, "Orthodox Liturgy and the Care for Creation." Retrieved February 21, 2009. ↑ Clifford Geertz, "Thick Description: Towards an Interpretive Theory of Culture," The Interpretation of Cultures (New York: Basic Books, 1973), 3-31. ↑ Gil Daryn, "Moroccan Hassidism: The Chavrei Habakuk Community and its Veneration of Saints," Ethnology 37(4) (Fall 1998): 352-53. ↑ Karine Schomer, The Sant Tradition in Perspective, in Sant Mat: Studies in a Devotional Tradition of India, edited by K. Schomer and W. H. McLeod (Delhi: Motilal Banaridass, 1987). ↑ Robert F. Campany, "The Real Presence: Manifestations of the Bodhisattva Guanshiyin in 4th- to 6th-century Chinese popular narratives," History of Religions 32(3) (Feb. 1993): 233. Campany, Robert F. "The Real Presence: Manifestations of the Bodhisattva Guanshiyin in 4th- to 6th-century Chinese popular narratives." History of Religions 32(3) (Feb. 1993): 233-273. The Commemoration of Saints and Heroes of the Faith in the Anglican Communion: The Report of a Commission Appointed by the Archbishop of Canterbury. London: S.P.C.K., 1957. Cunningham, Lawrence S. The Meaning of Saints. San Francisco: Harper & Row, 1980. Daryn, Gil. "Moroccan Hassidism: The Chavrei Habakuk Community and its Veneration of Saints." Ethnology 37(4) (Fall 1998): 351-73. Deuffic, Jean-Luc (ed.). Reliques et sainteté dans l'espace medieval. Retrieved August 13, 2007. Geertz, Clifford. "Thick Description: Towards an Interpretive Theory of Culture." In The Interpretation of Cultures. New York: Basic Books, 1973. Hawley, John Stratton (ed.). Saints and Virtues. Berkeley, CA: University of California Press, 1987. Hein, David. "Saints: Holy, Not Tame." Sewanee Theological Review 49 (2006): 204-217. Hein, David. "Farrer on Friendship, Sainthood, and the Will of God." In Captured by the Crucified: The Practical Theology of Austin Farrer. Edited by David Hein and Edward Hugh Henderson. New York: Continuum, 2004. Perham, Michael. The Communion of Saints. London: Alcuin Club/SPCK, 1980. Rowley, Sherry. "On Saint Brigit and pagan goddesses in the kingdom of God." Canadian Woman Studies 17(3) (Summer-Fall 1997): 93-95. Schomer, Karine. "The Sant Tradition in Perspective" in The Sants: Studies in a Devotional Tradition of India. Edited by K. Schomer and W. H. McLeod. Delhi: Motilal Banaridass, 1987. ISBN 0961220805. Vauchez, André. Sainthood in the Later Middle Ages. Translated by Jean Birrell. Cambridge: Cambridge University Press, 1997. Woodward, Kenneth L. Making Saints. New York: Simon & Schuster, 1996. This page was last modified on 23 February 2009, at 21:55.